Happy Fourth, everyone! Keeping it small and simple today, because I know you’re all celebrating one way and another. This week’s book recommendation list is all about picture books. It’s not a comprehensive list of our favorites. I’m guessing our taste is common enough that you’ve already heard of them all anyway. Nope, today we have just three picture books you should absolutely buy and absolutely read to your kids and also absolutely use to build your confidence to tell more of your own stories. Books to inspire you! 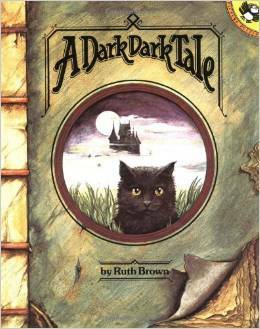 A Dark, Dark Tale by Ruth Brown – This book couldn’t be simpler. “Once upon a time there was a dark, dark moor. On the moor there was a dark, dark wood.” On and on it goes just the same, leading you through the dark, dark world to a tiny little surprise ending. My kids loved this book at a wide variety of ages. It’s wonderful. But here’s the thing, guys. It’s all in how you read it. You just drag out the words “dark, dark” in your most ominous voice, letting the suspense build as they hang on your every word until the anti-climactic ending seems hilarious. YOU COULD TOTALLY DO THIS. You could make up a story that didn’t even have a plot or anything, and if you infused your voice with enough drama and paced it nice and slow, your kids would be on the edge of their seats. 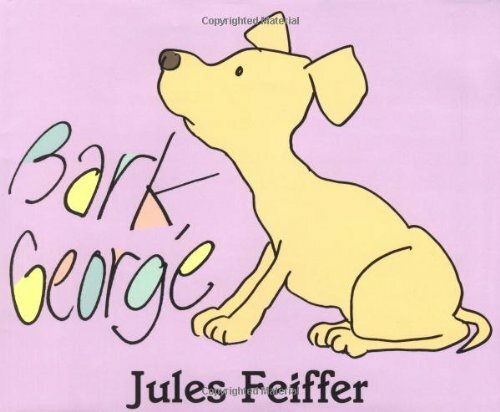 Bark, George by Jules Feiffer – You’ve probably heard of this one. It’s a genius little book. George has an eating problem and tends to talk like whatever he’s eaten. Very fun and very funny. Your kids are guaranteed to like it. What I think you should see is that this is just one very, very fun idea. What would happen if a dog made the sounds of things it had eaten instead of barking? Then with some expert use of repetition (and sure, some awesome drawings) it’s a wonderful, entertaining book. This is basically just our four step storytelling method in action. The character: George. The weirdest thing he could do? Make noises of things he’s eaten. Obvious problem caused? Mom freaks out. Obvious solution? She takes him to the vet and has things removed. YOU COULD TOTALLY DO THIS. 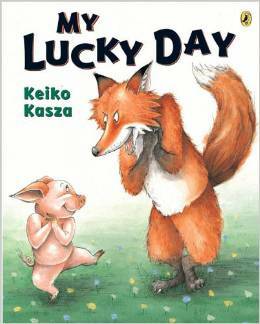 My Lucky Day By Keiko Kasza – My kids still really love this book, which is about a pig who is “captured” by a fox and then bathed, fattened, and massaged before slipping away. In the end we find out the pig arranged the whole thing and it’s his lucky day, not the fox’s. I’ll post soon about the topsy-turvy method of inventing a story. This is a great example. You just take a really ordinary concept (in this case, the big animal capturing and eating the little animal) and turn it on its head. It’s not as hard as you may think. It’s a world where you eat dinner in the morning and breakfast at night or a mouse who chases a cat who chases a dog. YOU COULD TOTALLY DO THIS.